Bus from Kuala Lumpur to Jelawat is a convenient and important transportation for locals. Jelawat is a village in Bachok, Kelantan. This direct bus service from Kuala Lumpur to Jelawat is budget-friendly and time-saving for working adults and students in Kuala Lumpur whose hometowns are in Jelawat. With no train and flight coverage between the capital and Jelawat, bus services will continue to play an important role in connecting the two places. Perdana Express is the one and only bus operator who offers bus from Kuala Lumpur to Jelawat. Perdana Express is one of the major bus operators specializing in east coastal (Kelantan, Terengganu and Pahang) express bus services. Their brand is well-known among Malaysians, especially for those who are from the East Coast states of Malaysia. Perdana Express provides a total of 3 bus departures from Kuala Lumpur to Jelawat. The first bus service starts from 9:45am. The following bus schedules are 9:30pm and 10:00pm. Please note that there is no bus available for afternoon sessions. The duration required from Kuala Lumpur to Jelawat is about 7.5 hours. The travel time depends on road traffic and weather conditions. At least 1 stopover will be given for a washroom break, while additional stopovers can be arranged upon request from the bus driver. Bus fare is reasonably charged at RM44. 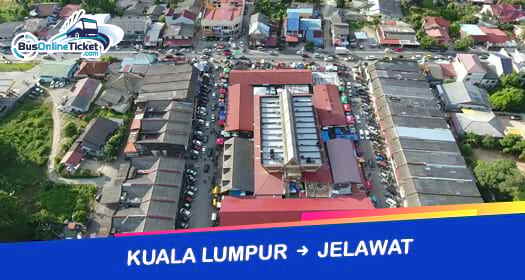 Bus from Kuala Lumpur to Jelawat will pick up all passengers at the main transportation hub in Kuala Lumpur, which is known as Terminal Bersepadu Selatan (TBS). Upon reaching Jelawat, the bus service will terminate at Jelawat Bus Terminal. BusOnlineTicket.com is the most reliable and convenient online booking portal. BusOnlineTicket.com allows you to purchase bus tickets online anytime and anywhere, so long as you can connect to the Internet on your device. Instant booking confirmation will be given once payment is received.